Since the weather outside is frightful and the fire is so delightful, whack some sausages on it and then open a bottle of carmenère. 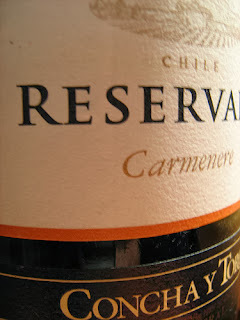 Carmenère is a much underappreciated grape in my opinion and it is one that is a perfect winter warmer. Often refered to as "Merlot with balls", it has a hearty character with red and black fruit flavours and a nice hint of spice, therefore making it a perfect match for nice winter foods like stews, chilli con carne, and good old sausage sarnies with mustard. 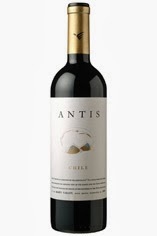 Believed to have originated in Bordeaux in France, it was widely cultivated in the Medoc region in the 18th century, however it is now most commonly associated with producing gutsy reds from Chile. Often, cracking carmenère doesn't break the bank either, which is a bonus, with quality wines starting from as little as £5/6 per bottle - a prime example is the Lascar Carmenère that was was featured in my Full Bodied Reds For Bonfire Night post on Wednesday of last week. Majestic have come up trumps again on this one. 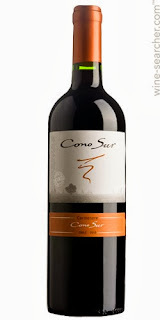 This is a proper old-skool carmenère that is more savoury than most. It has nicely developed flavours with a nice herbal note. The spice is still there and the fruit is soft and nicely developed. This is normally £11.99 a bottle but Majestic currently have it on offer at £8.99 provided that you buy 2 Chilean wines on your order. If you are feeling a bit flush or would like to treat a close red-loving friend to a good Christmas present then this could be spot on. This is from world-renowned Burgundian producer William Fevre, although it comes from the company's winery in Chile. Although this is a Chilean blended wine, it is predominantly Carmenère, alongside equal portions of Cabernet Sauvignon and Cabernet Franc. With a definite Bordeaux twist, this is a very interesting wine that is beautifully complex. It is certainly firm due to the Cabernet Sauvignon but the Cabernet Franc brings extra fruit. This is definitely one to have with a well-made chilli con carne on a cold evening. This top notch wine is available from Berry Bros for (ahem) £50 a bottle. But come on, we all need to treat ourselves sometimes. Top photo taken from cchiao's photostream under the Creative Commons License.